The UK has been placed on its highest level of terrorism alert after an attack on Glasgow Airport was linked to two car bombs found in London. Two men were arrested after ramming a burning car into the airport's main terminal, a day after police thwarted two attempted bombings in the capital. Police said the incident was being treated as terror related. Later, two more arrests were made on the M6 in Cheshire in connection with the two incidents. Anti-terror police from the Metropolitan Police's Counter Terrorism Command assisted by officers from the West Midlands Counter Terrorism Unit made the arrests, Scotland Yard said. Peter Whitehead was driving on the M6 when he witnessed the arrests there. He told BBC News 24 that three cars straddled the motorway and brought traffic to a halt. "It turned out they were unmarked police cars. In front of them were a couple of other unmarked police cars and they forced a car onto the hard shoulder and got the occupants out and as far as I can see arrested them," he said. Strathclyde Police told a news conference the attack on Glasgow Airport was now being linked to the car-bomb plot in London - foiled by police on Friday. Chief Constable Willie Rae said: "There are clearly similarities, and we can confirm that this is being treated as a terrorist incident." 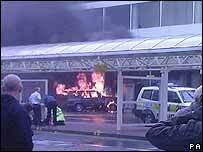 Two men were arrested at the scene at 1515 BST after the blazing Jeep Cherokee was driven into the airport's main terminal. One of the suspects taken to the city's Royal Alexandra Hospital to be treated for severe burns was in possession of "a suspect device" which had been found on his person, Chief Constable Rae said. The item was examined by experts and found not to be an explosive device. The second man was being detained in police custody while the vehicle was said to be too unstable to be removed from the airport. 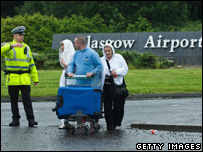 BBC home affairs correspondent Danny Shaw said the events at Glasgow Airport dramatically altered the direction of the London car bombs inquiry. He said the fact that Deputy Assistant Commissioner Peter Clarke, who is leading the London investigation, travelled to Scotland suggests the two attempted attacks could have been carried out by the same individuals or by members of the same cell. And the decision to raise the threat level to "critical" - which means an attack is imminent - reflected concern that those responsible have the capability and intent to carry out further bombings. All flights to and from Glasgow Airport were suspended on Saturday. A number of other airports have stepped up security, including Edinburgh, Newcastle, Birmingham, Manchester and Blackpool. John Lennon Airport in Liverpool has been closed as a precaution. Security has also been tightened at airports across the US following the attempted attacks. The national terrorism threat level was raised after a meeting of the government emergencies committee, Cobra. Ministers, police and security service officials held their third meeting of Cobra in recent days on Saturday evening, this time with a video link to ministers in Scotland. 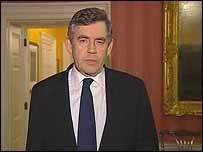 "I know the British people will stand together, united and resolute," he said. In a televised statement, Mr Brown thanked the police, the security and emergency services for the "dedicated professionalism" that has been shown in London and Glasgow Airport. "The first duty of the government is the security and safety of all the British people, so it is right to raise the level of security at airports and in crowded places in the light of the heightened threat," he said. The critical threat level indicates terrorist attacks are imminent. It is the highest possible level and was also in place after the 7 July 2005 suicide bomb attacks on London. A Scottish government spokesperson said Scottish Ministers were in touch with their Whitehall opposite numbers and First Minister Alex Salmond and have spoken to Mr Brown. Mr Salmond and Justice Secretary Kenny MacAskill took part in the Cobra meeting. Mr Salmond echoed the prime minister's calls for vigilance. "We cannot and must not live our lives in a state of alarm but alert individuals have a substantial role to play in supporting our police services," he added. Earlier in the day, Cobra met to discuss the London car bomb attempts. In the early hours of Friday, two Mercedes containing petrol, gas cylinders and nails were found left outside the Tiger Tiger club in Haymarket and a nearby street but the devices did not detonate. Police in the capital are checking CCTV footage in their investigation into the planting of the two car bombs. Unconfirmed reports suggest police may have an image of a suspect leaving the vehicle left outside the Tiger Tiger club. Police increased patrols and security for events in London over the weekend, including the Gay Pride parade, the Concert for Diana at Wembley Stadium and the Wimbledon tennis championships.